DATCP’s Pest Bulletin has indicated an uptick in 2017 Western bean cutworm (WBC) activity (26/trap) compared to 2016 (20/trap). Now will be a good time to assess local populations and/or if control recommendations were successful by looking for ear damage in the field. WBC ear feeding is fairly diagnostic and not easily confused with European corn borer – although there can be some gray areas. 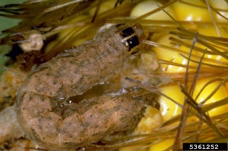 Second generation European corn borer feeding is usually confined to small areas of the ear tip and larvae will be present on most of the damaged ears. WBC feeding is more extensive and will range from kernel scrapings to completely consumed kernels. This damage may be located on the ear tip but as frequently on the side of the ear. Exit holes will soon be noticeable as larvae leave the ear to overwinter in the ground. Molds may also be present on injured kernels. Bird damage to the ear and/or husk can be an early indicator of insect damage. However, field scouting is required to determine which species the birds were feeding on. Seed purchases will soon be considered as will selection (+/-) for Bt traits. In the absence of local pheromone traps, scouting for late season field damage can help with those decisions. The UW IPM program has a video about WBC on YouTube; check out the link below.